دانش‌پور, امیررضا, دانش‌پور, حمیدرضا. (1390). فرصت‌های نوین مشارکت در مدیریت شهر الکترونیک. مجله علمی-ترویجی منظر, 3(17), 82-87. امیررضا دانش‌پور; حمیدرضا دانش‌پور. "فرصت‌های نوین مشارکت در مدیریت شهر الکترونیک". مجله علمی-ترویجی منظر, 3, 17, 1390, 82-87. دانش‌پور, امیررضا, دانش‌پور, حمیدرضا. (1390). 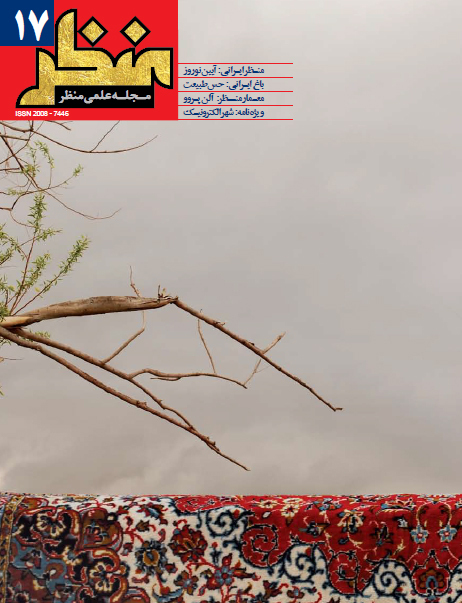 'فرصت‌های نوین مشارکت در مدیریت شهر الکترونیک', مجله علمی-ترویجی منظر, 3(17), pp. 82-87. دانش‌پور, امیررضا, دانش‌پور, حمیدرضا. فرصت‌های نوین مشارکت در مدیریت شهر الکترونیک. مجله علمی-ترویجی منظر, 1390; 3(17): 82-87. دموکراسی در سراسر جهان متداول‌ترین شیوه اداره حکومت است و می‌توان گفت که دموکراسی‌سازی دولت‌ها و جوامع جهانی با استفاده از فن‌آوری اطلاعات، حرکتی رو به پیشرفت داشته است. دولت الکترونیک یا دولت دیجیتال، به استفاده دولت از فن‌آوری اطلاعات برای جابجایی اطلاعات بین مردم، سازمان‌ها، بازار و ارکان دیگر دولتی گفته می‌شود. به عنوان بخشی از دولت الکترونیک، مشارکت الکترونیک، نشان‌دهندة یک شیوه تعاملی نوین میان مدیریت شهری از یک سو و شهروندان از سوی دیگر است. این شیوة مشارکت می‌بایست با نیازها و مهارت‌های استفاده‌کنندگان و ترکیب مناسبی از فن‌آوری‌ها، فرایندها و شیوه‌های تعبیه شده در یک ساختار سازمانی موجود شامل ملاحظات استراتژیک گروه‌های هدف، هماهنگی و سازگاری داشته باشد. در پژوهش پیش روی، مفاهیم، زمینه‌های فنی و فرهنگ مشارکت الکترونیک تبیین شده و جایگاه مشارکت الکترونیک در شهرهای هلسینکی و فرانکفورت مورد مطالعه و ارزیابی قرار گرفته است. این تحقیق با استفاده از پرسشنامه الکترونیکی بین 500 خانوار ساکن در شهر هلسینکی و استفاده از سیستمی تلفیقی برای تعاملات فضایی در یک شرایط آزمایشی (آزمایشگاه ارتباطات آنلاین)، در شهر فرانکفورت، مورد ارزیابی قرار گرفت. از مهم‌ترین نتایج پژوهش، لزوم استفاده از شبکه محلی با سرعت بالا و در دسترس برای همه شهروندان، ایجاد یک جامعه مجازی و پدید آوردن شرکت‌های خانگی و همچنین توجه به مسایلی از قبیل کیفیت، چارچوب زمانی، هزینه‌ها، روش و ابزار در هنگام تدارک زیرساخت‌های لازم جهت مشارکت الکترونیکی شهروندان است. 1, M.A. in urban planning, Shiraz University, Shiraz, Iran. 2M.A. in urban planning, Shiraz, Iran. Throughout the world, democracy is the most popular system of government, and it can be stated that the democratization of the states and the world community has moved forward since 1989. Nevertheless, democracy as a system of government and democratic way of life is threatened by an inner erosion endangering the established democracies of Western European countries. The term e-participation stands for procedures, in which decision makers consult with citizens in a communication process in order to prepare a decision. As a part of e-Government, e-participation represents an electronically supported mode of interaction between the political administrative system on the one hand, and the citizens on the other hand. E-participation is a part of e-governance and is as thus defined by the Digital Governance organization as following. In the digital Governance, citizens, associations, and community can directly participate in the decision-making process by exploiting the interactive base of network technologies. Forum, online polls, consultations or e-voting systems are technology solutions that increase the involvement of citizens and other players, in a rich virtual context in terms of information. Table 1 illustrates how participation in digital governance differs from participation in conventional government approaches. To be successful, e-participation projects should base on a multi-dimensional socio-technical approach regarding their internal relevance, indicated by the quantitative and qualitative outcomes of the online- discourse, and their external relevance, which targets the probability on how deliberative produced knowledge is being heard and regarded by political actors. Mainly approaches are characterized by absence of acceptance which leads to a lack of participation and thereby to a low level of productivity of the discourse on one side, and missing commitment by civil servants and political actors on the other side. The lesson learned so far is that e-participation should be adapted to the needs and skills of the users by a tailored mix of technologies, procedures, or methods embedded into the existing institutional structures including strategic considerations of the target groups or initiators. In recent years evaluated pilot projects revealed the deep socio-technical character of e-participation. The Helsinki/Arabianranta and the Germany/Frankfurt cases highlight the importance of understanding the interrelationships of the three enabling and constraining structures within which the development of e-participation takes place; firstly the policy context, secondly the concrete technological structures and solutions, and thirdly the organizational and social structures sustaining e-participation on the municipal and the local level. The experience from Arabianranta/Helsinki shows that intermediary level organizations such as the local development agency Art and Design City Helsinki Ltd., residential associations, and active citizen groups, such as the voluntary e-moderators, are playing a very significant role in the development of the citizen’s e-services. Therefore the following main conclusions and recommendations are offered in this article: The use of various information tools and services is becoming an integral aspect of all functions of local governance. Local governments need strategies, resources and involvement of the top management in guiding the development of these tools and infrastructures to a chosen direction. The municipal systems and practices of planning and decision making need to be actively developed hand in hand with the user applications.